The key to improving fleet safety is monitoring and coaching driver behavior, but for fleets with a pool vehicle system, driver safety has posed a unique challenge. Now with the latest solution from Donlen, it is possible for fleet managers to pinpoint risky behavior by driver – instead of by vehicle – in order to increase driver accountability, improve fleet safety, and reduce costs. DriverPoint Driver Identification is a combined hardware and software solution designed to help fleet managers identify specific drivers of a fleet vehicle. 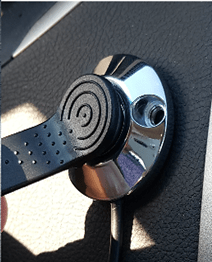 Donlen’s Driver Identification device uses Near-Field Communication (NFC) technology to allow drivers to swipe in and out of the vehicle. With this device installed in pool vehicles, fleet managers can track driving behavior on an individual basis instead of simply by vehicle. Using the power of our existing DriverPoint Telematics and fully integrated into our FleetWeb® fleet management platform, DriverPoint Driver Identification gives managers of pooled vehicle fleets access to the necessary real-time data to monitor individual driver behavior to identify safety and savings opportunities. Fleet safety is a critical issue for many fleet professionals, and in order to improve fleet safety, it’s important to focus on driver accountability. At Donlen, we provide the solutions that fleet managers need to hold drivers accountable and proactively assign safety training courses to improve fleet safety. Identifying risky behavior is the first step in holding fleet drivers accountable for their driving habits. You can use exception reports in FleetWeb to monitor specific events such as excessive speed, and then when violators are identified you can send them catered, assigned safety training courses to remedy safety risks. One Donlen customer has already seen significant improvements across their fleet by implementing DriverPoint Driver Identification for their fleet vehicle pool. Since implementing Driver Identification, the customer’s fleet has reduced acceleration and deceleration events, decreased preventable accidents, and improved fuel economy and Total Green Rating. One trend that our customer identified is that drivers with a consistent hard braking and acceleration history (acceleration and deceleration events) are more likely to get into an accident. 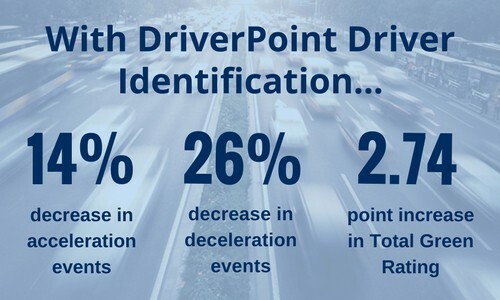 With Driver Identification, this customer has seen a 14% decrease in hard accelerations and a 26% decrease in hard decelerations. By reducing that risky driving behavior, our customer has seen a marked improvement in preventable accidents per million miles, which in turn has led to significant cost avoidance. In addition to reducing accidents, decreasing the number of acceleration and deceleration events across their fleet has also helped the customer improve their fleet’s fuel economy, which reduces costs for the fleet. A fleet’s Green Rating is a composite score on a scale of 1 to 10 that represents various driving events such as idle time, hard accelerations and decelerations, and speeding. With Driver Identification, our customer improved their Total Green Rating by 2.74 points, indicating a significantly safer, more productive, and more fuel efficient fleet. With the ability to monitor risks across their fleet and track driver behavior on an individual basis, the customer was able to hold drivers of their fleet pool vehicles accountable, driving notable improvements in safety and cost across their fleet. Improve your fleet’s safety, fuel economy, green rating, and more by increasing driver accountability for your fleet pool drivers with Donlen’s DriverPoint Driver Identification. Want to learn more about improving your vehicle pool drivers’ safety with DriverPoint Driver Identification?